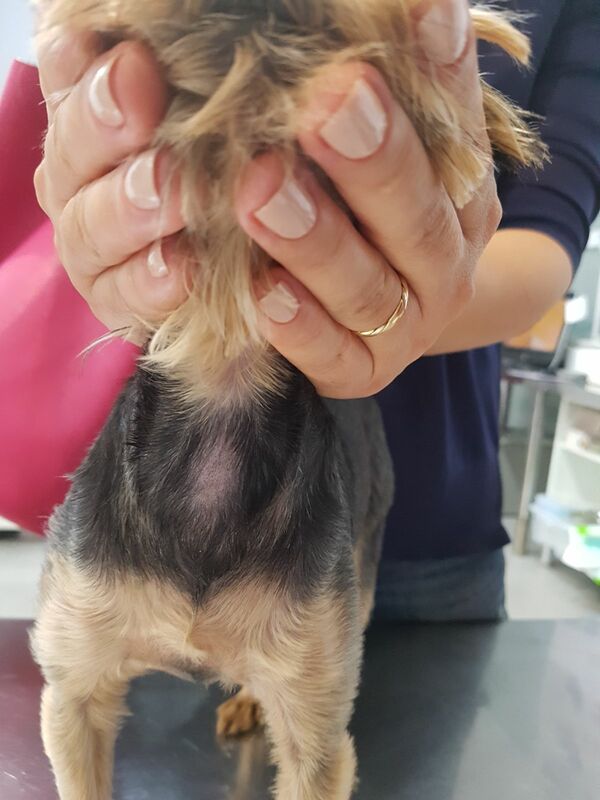 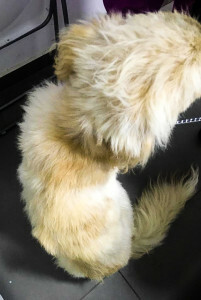 Dog, yorkshire terrier, F, 6 years old, spayed, vaccinated, dewormed and with fleas and ticks treatment done, 2 kg. She has been scratched for 2 weeks. A new cat was brought home three weeks ago. 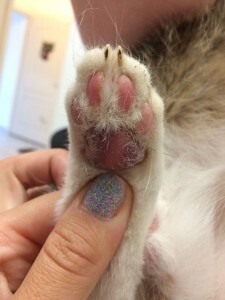 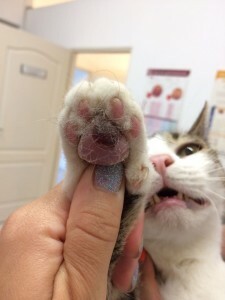 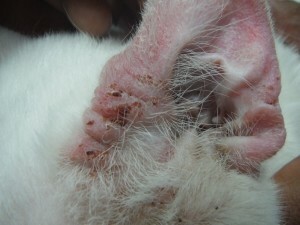 The cat present areas of alopecia on the tail. 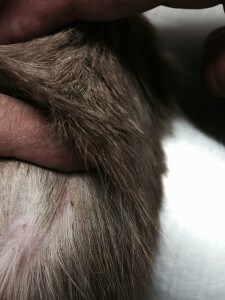 Circumscribed lesions on the shoulder (Fig. 1) and on ventral cervical region (Fig. 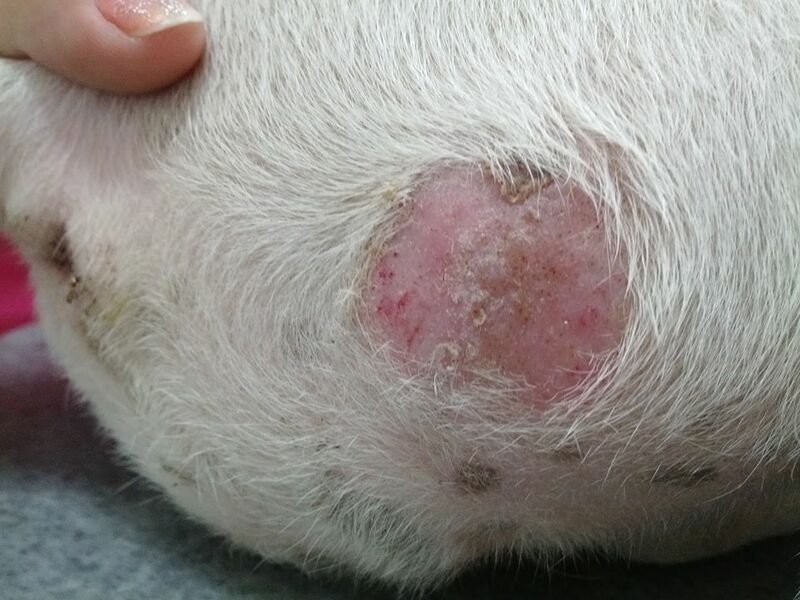 3), areas of round shaped alopecia with erythema, scaling. 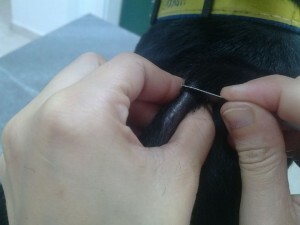 Remaining hairs may appear broken off. 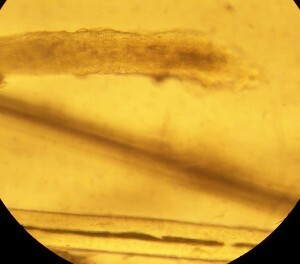 auricular pavilion (Fig. 4) and cervical ventral (Fig. 5) positive, fluorescent hairs. 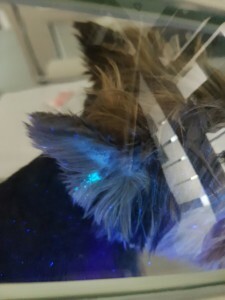 A true dermatophyte infection reveals an apple green fluorescence on the roots of the hair. Fig. 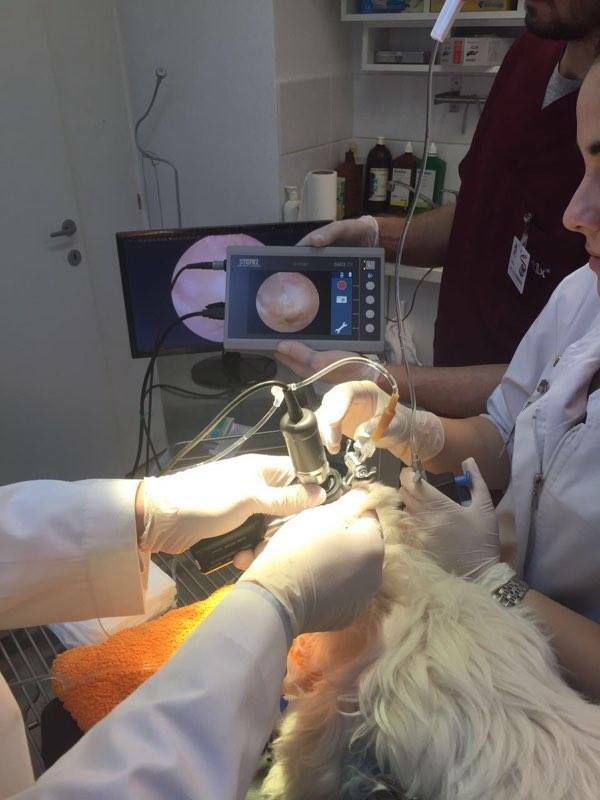 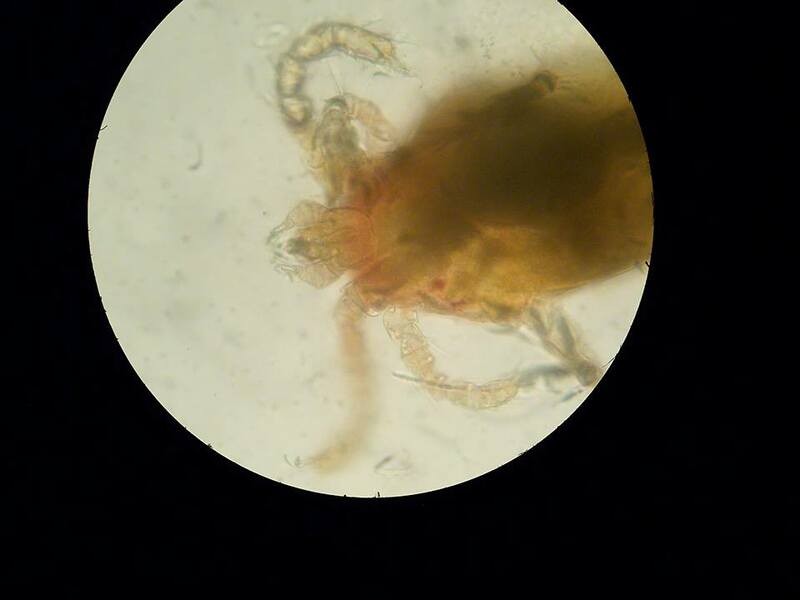 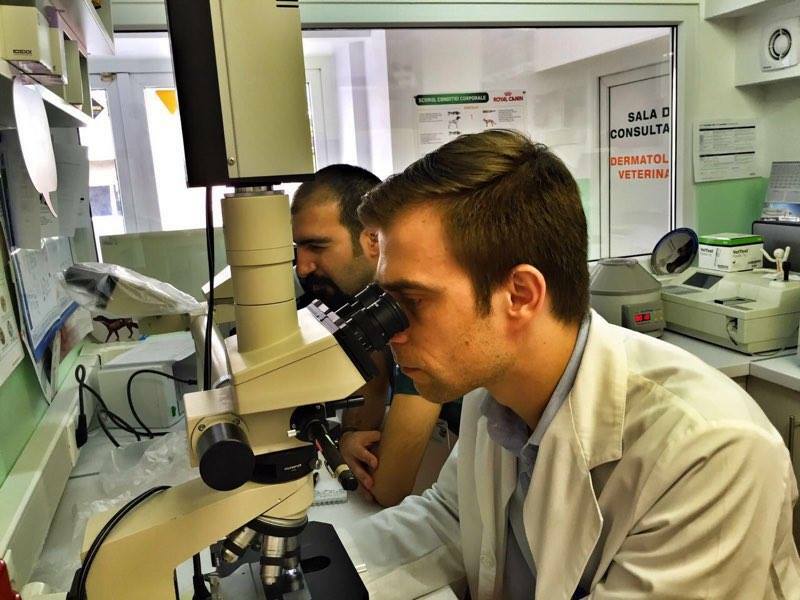 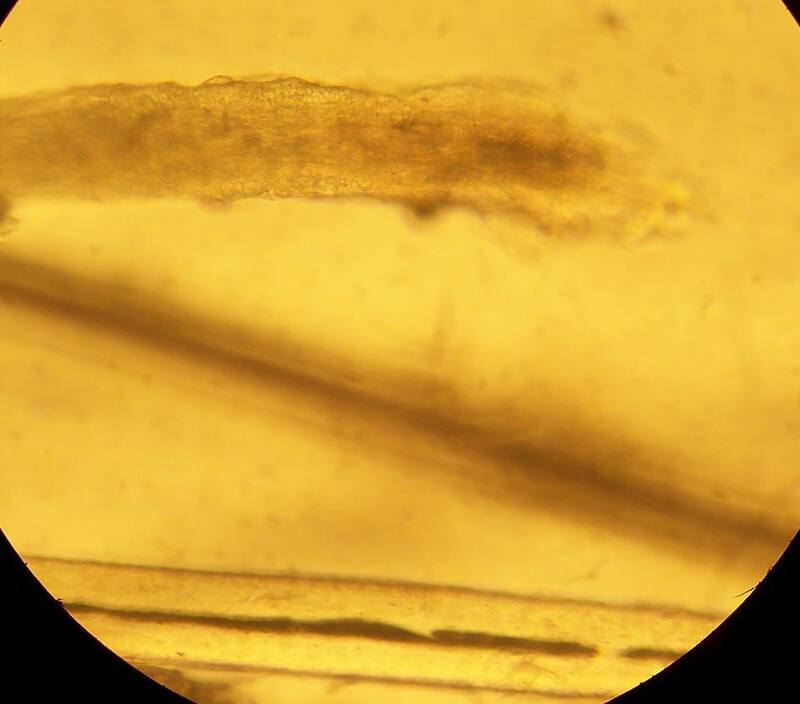 6: Microscopic examination – hair with modified structure of medulla and cortex. 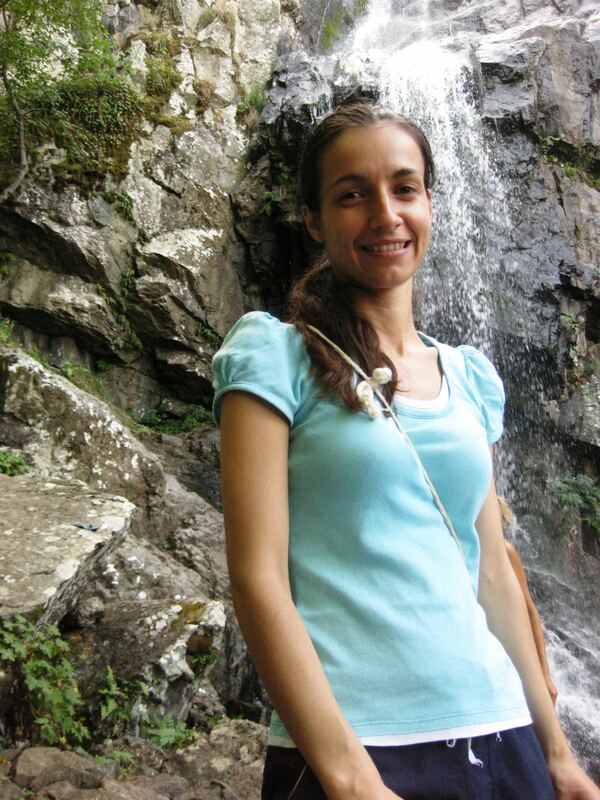 Other differentials (ex. 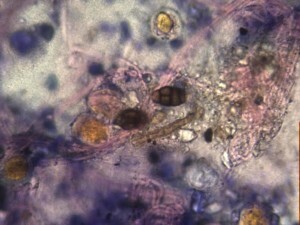 demodicosis, superficial pyoderma). 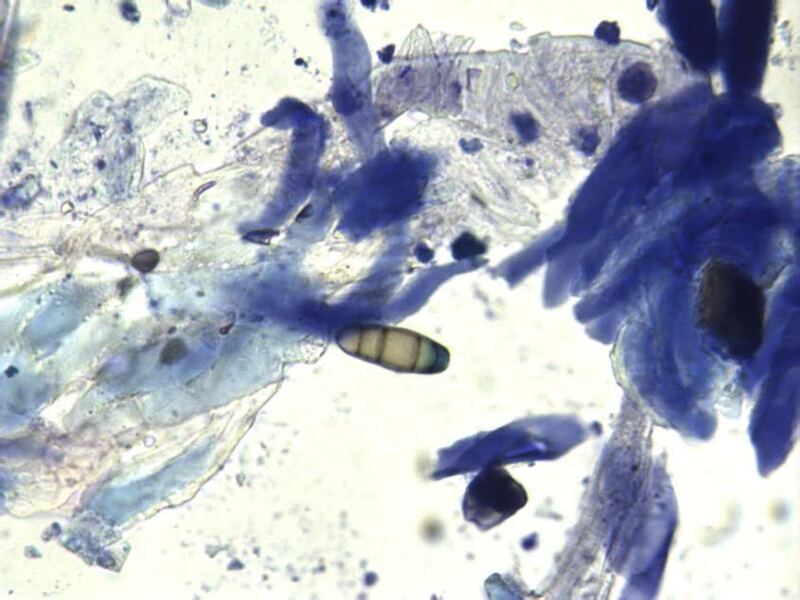 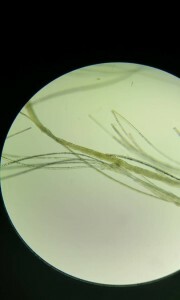 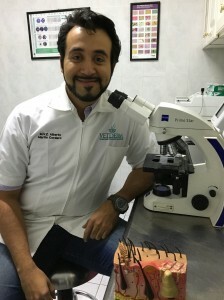 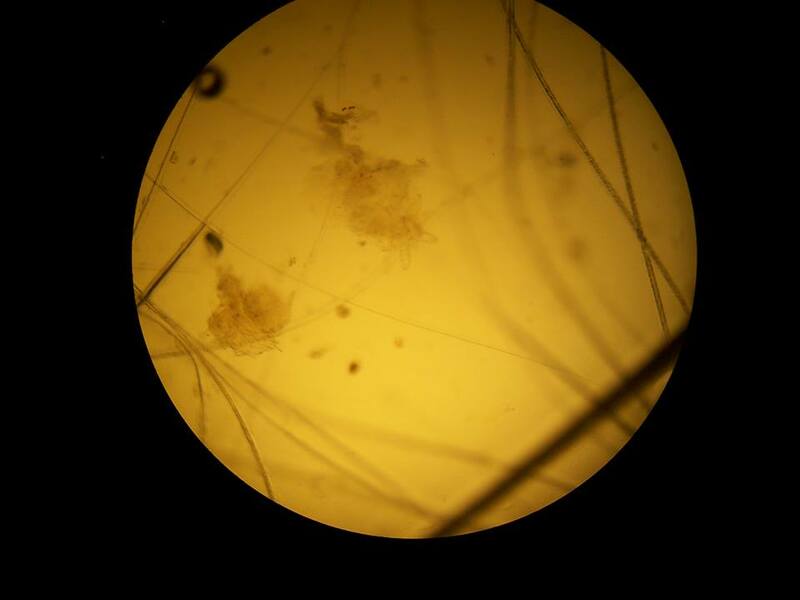 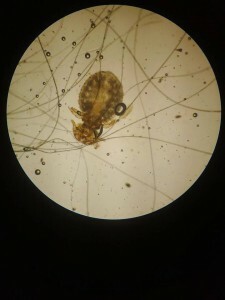 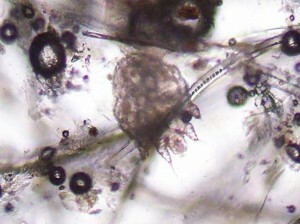 Wood’s lamp examination: typical yellowish-green fluorescent hair shafts that can be given by Microsporum canis strains; only Microsporum canis fluoresces and in only about half of cases. 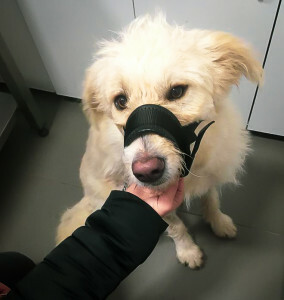 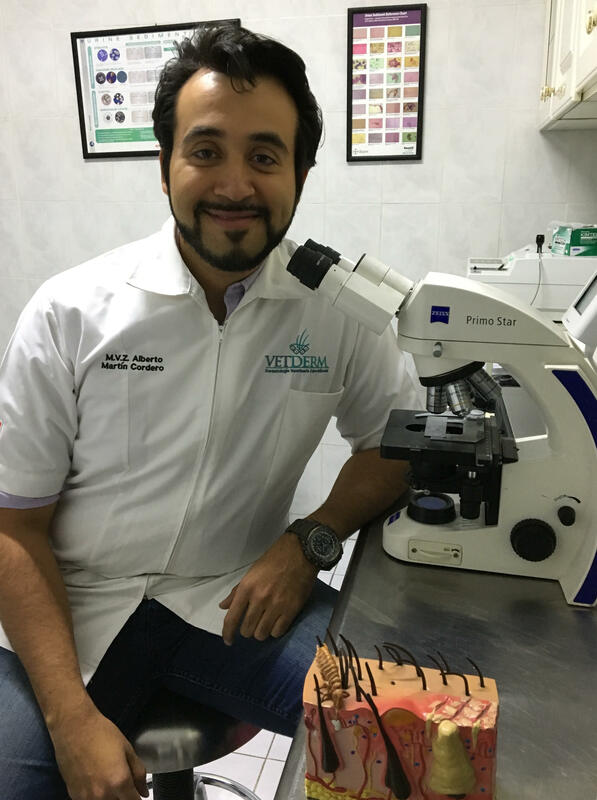 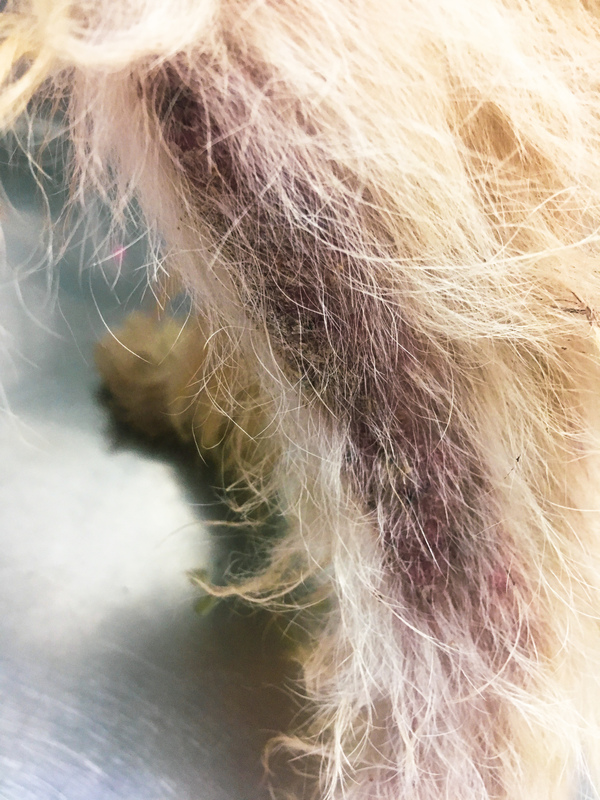 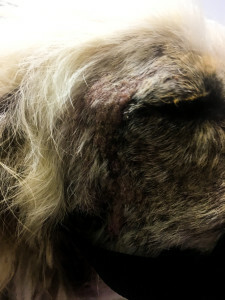 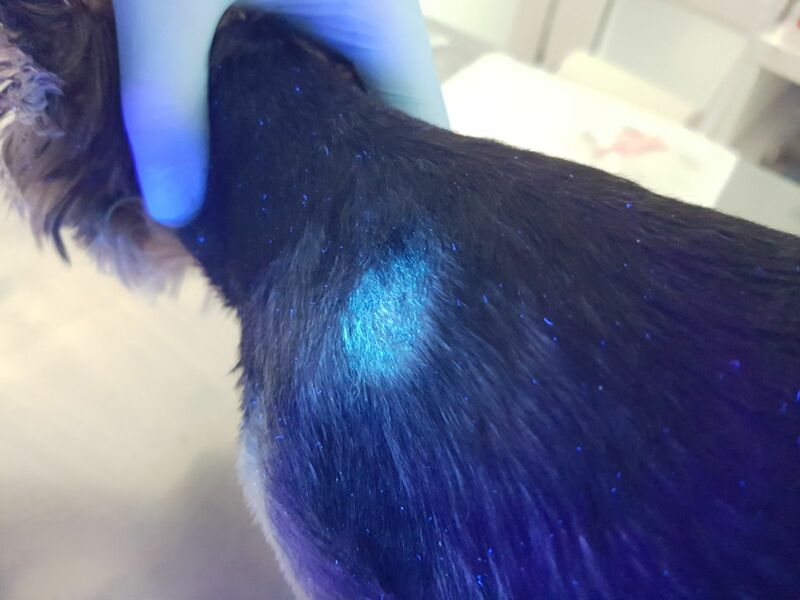 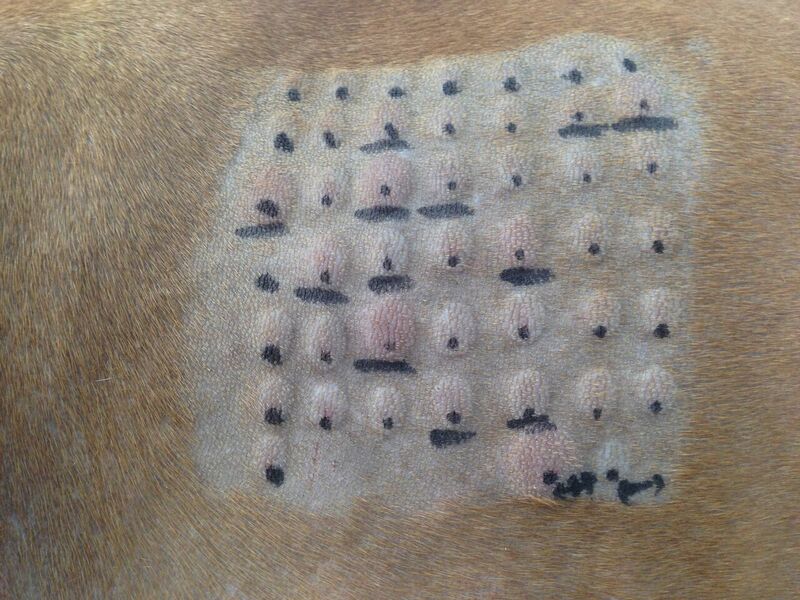 The Wood’s lamp is useful in establishing a tentative diagnosis of dermatophytosis in dogs and cats but false-negative and false-positive results are common. Definitive diagnosis is established by DTM culture. 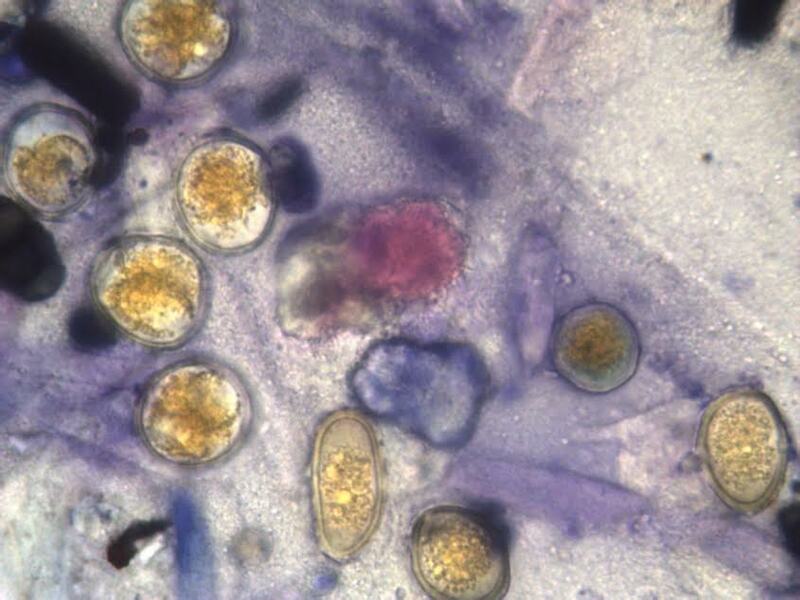 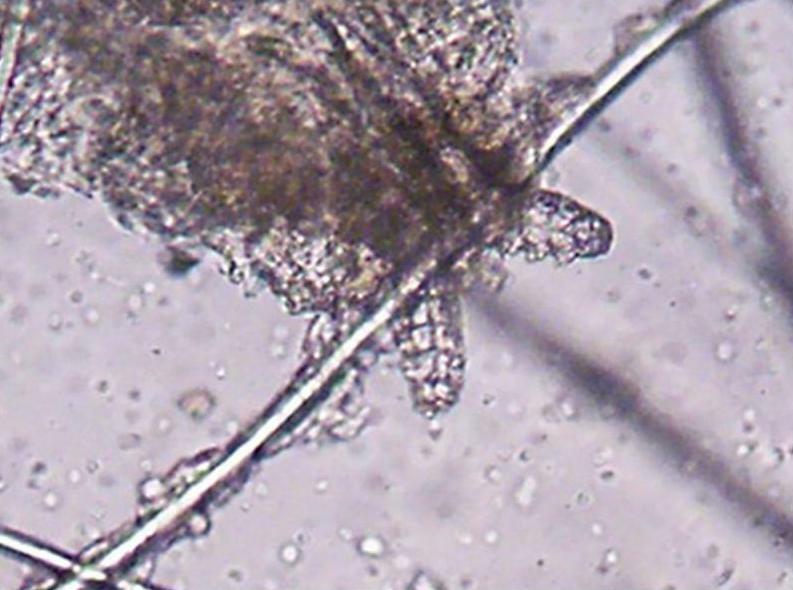 Trichogram: misshapen hair shafts infiltrated with hyphae and arthrospores. 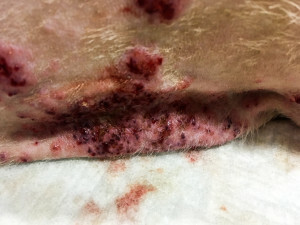 Topical antifungal treatment applied on whole body twice a week, for 6-8 weeks until the result of the DTM culture is negative. 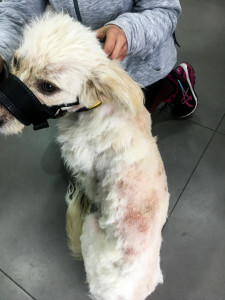 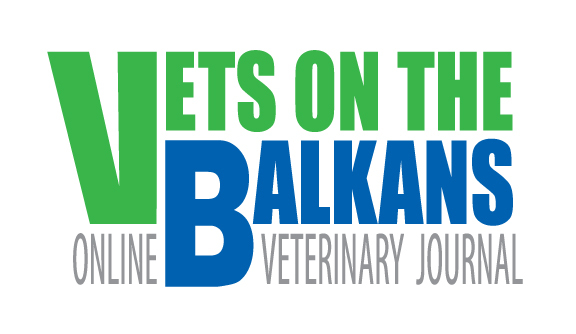 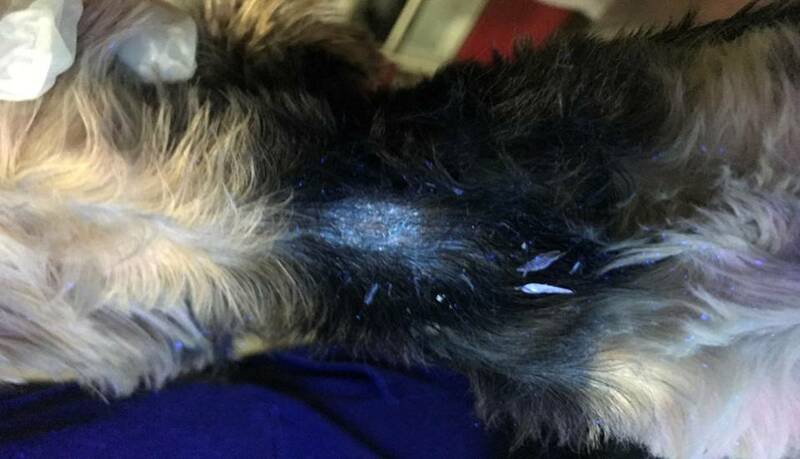 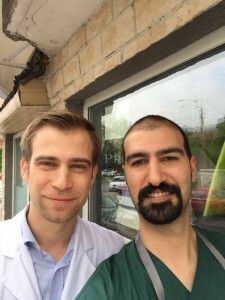 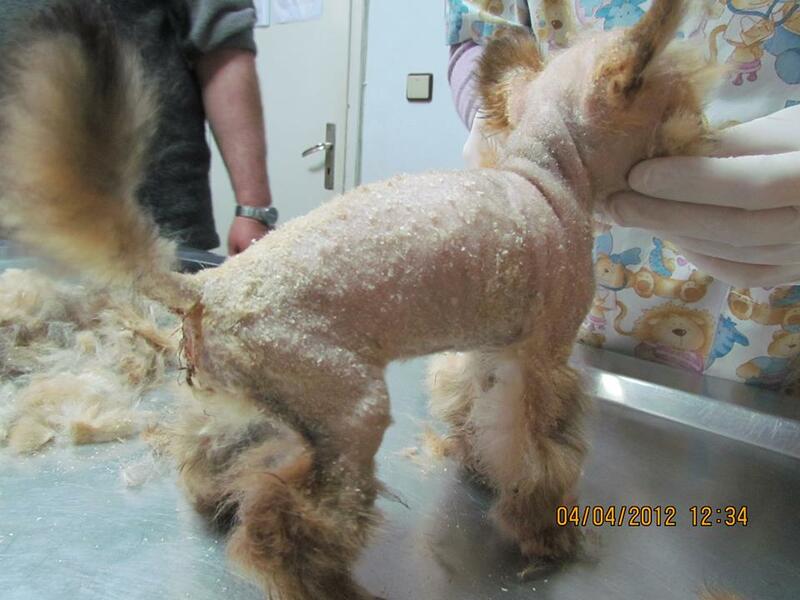 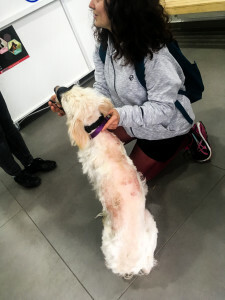 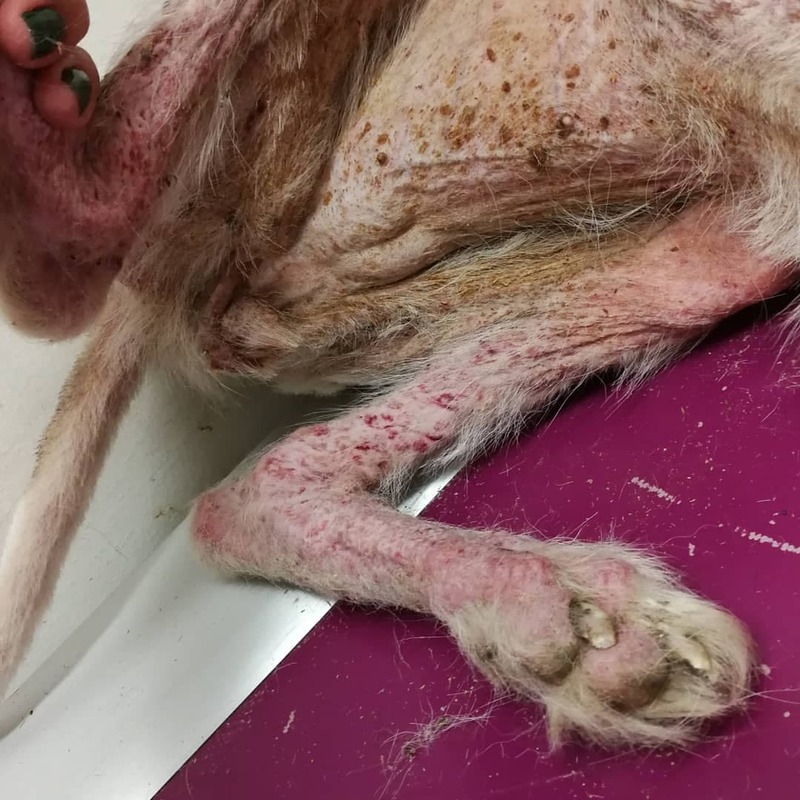 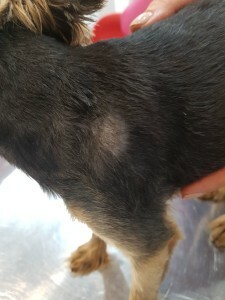 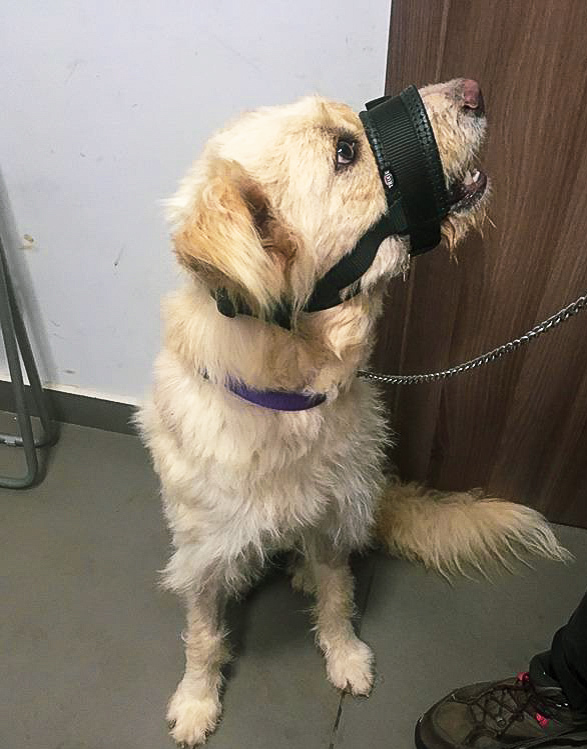 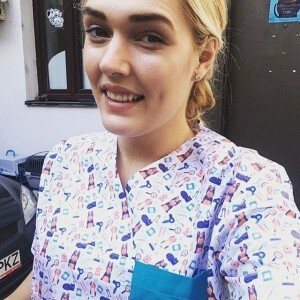 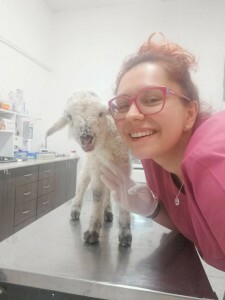 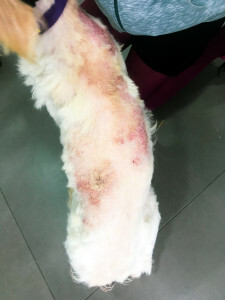 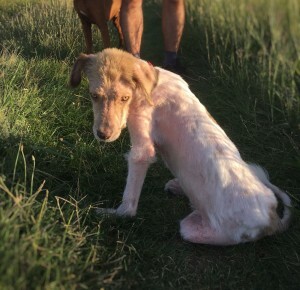 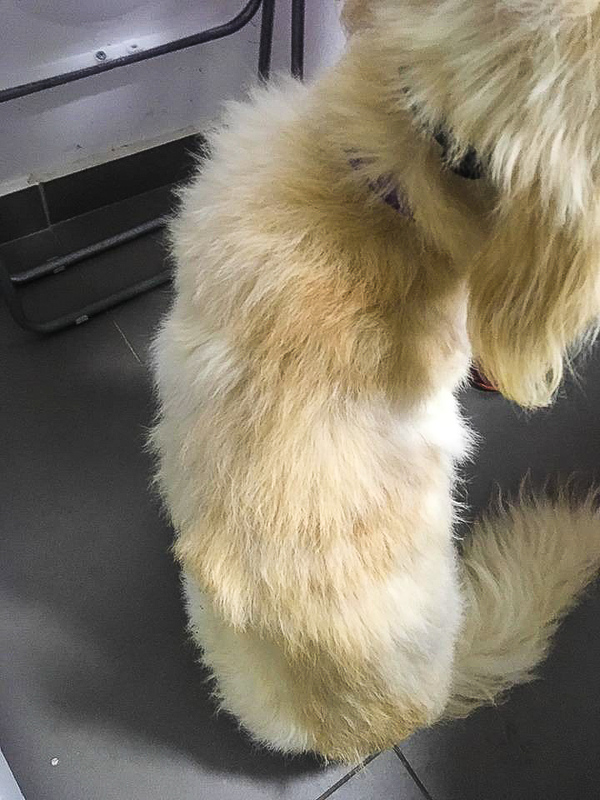 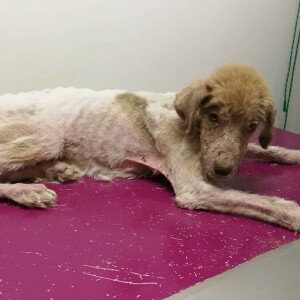 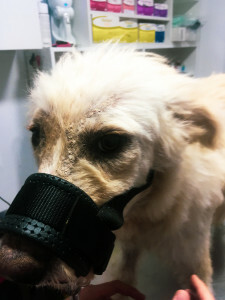 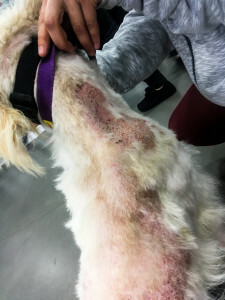 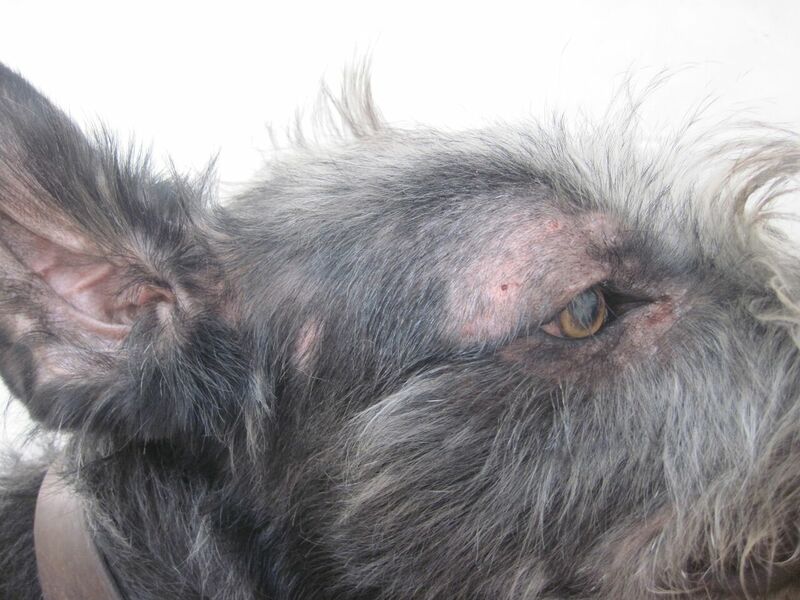 Bathing are recommended to be done with shampoo containing chlorhexidine and an antifungal (ex ketoconazole) after the animal has been clipped. Ointment containing clotrimazole applied locally in thin layer, daily. 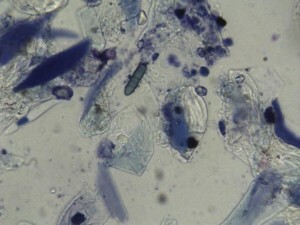 Environment: Decontamination measures in the house, where the animal stood (changed and washed carpets, bedding, beds, pillows), taking all measures to remove spores. Supplements based on Omega 3 and Omega 6, which will help reduce pruritus and inflammation. 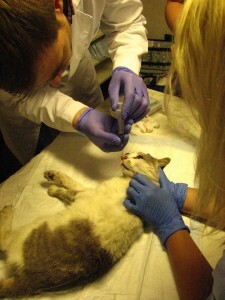 The prognosis is good. 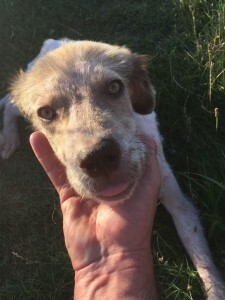 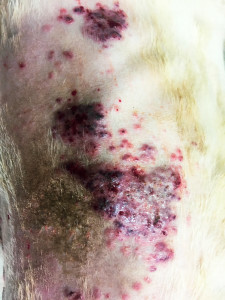 However, it should not be forgotten that dermatophytosis is a contagious disease that can be transmitted to other animals and humans. 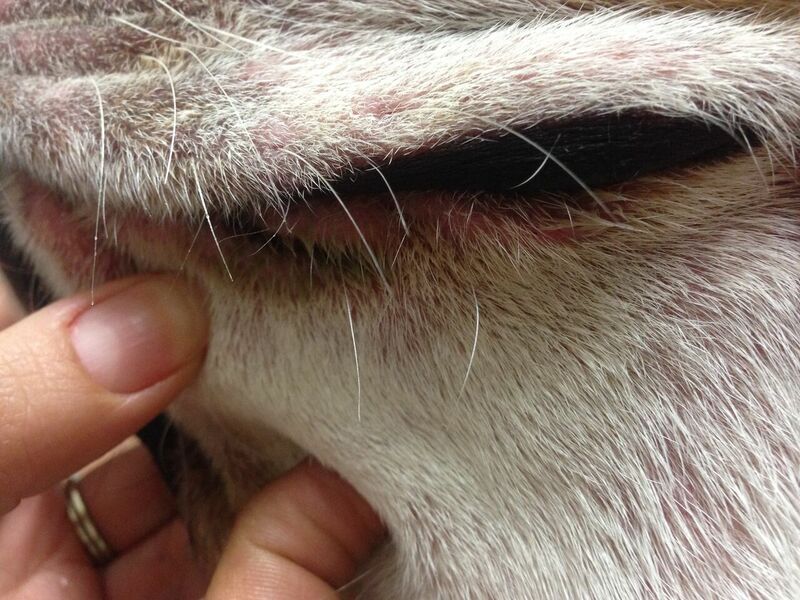 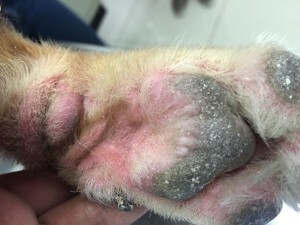 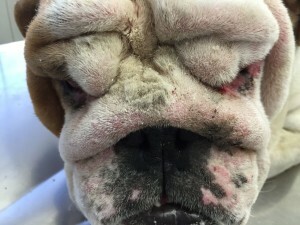 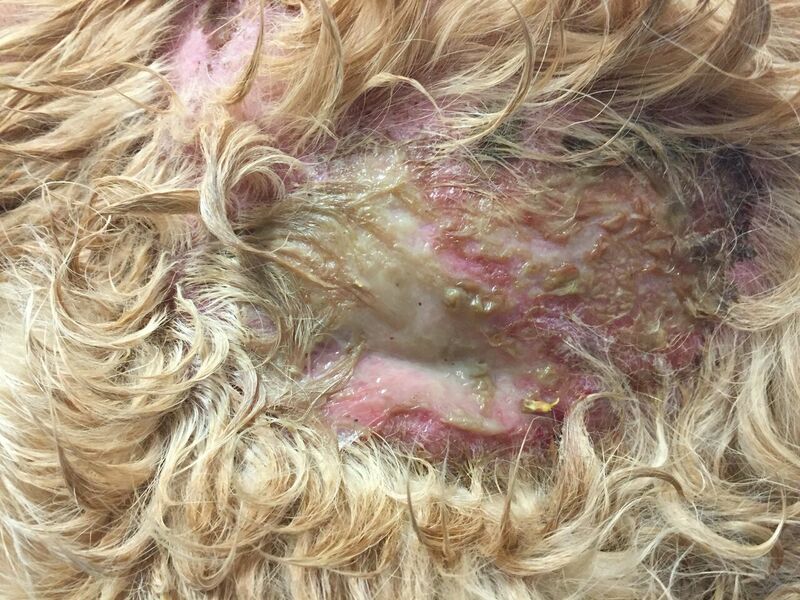 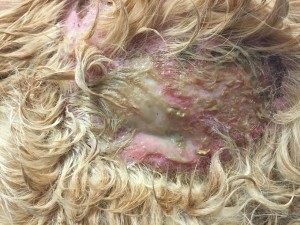 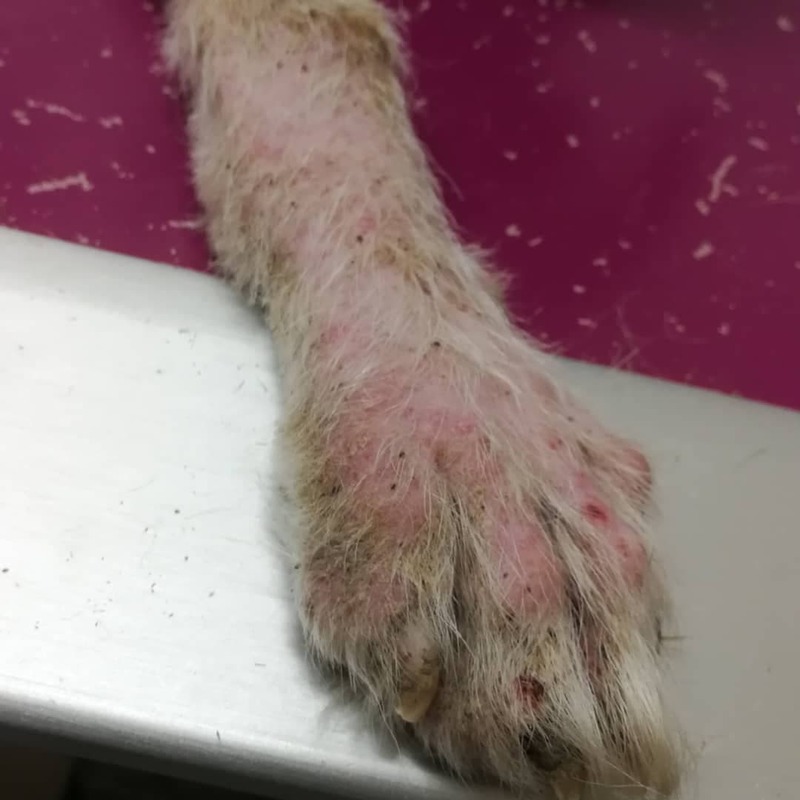 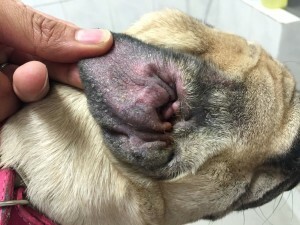 Rottweiler dog, 1 year old, male, intact develop intense pruritus, mild erythema, crusts and less-hairy skin on the phalanges, hocks; no other cutaneous lesion than this diffuse erythema. 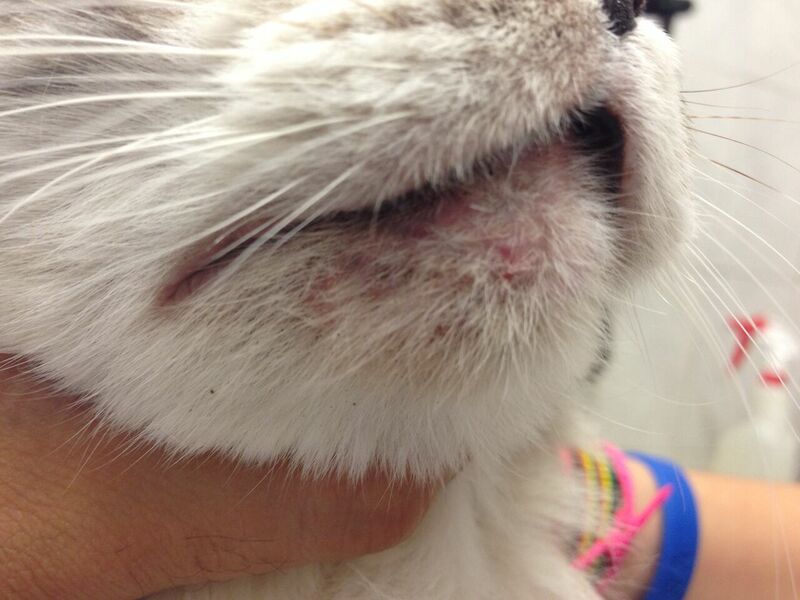 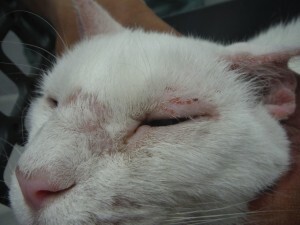 Other differentials (demodicosis, dermatophytosis, contact dermatitis, Malassezia dermatitis, hipersensitivity). Pinnal-pedal reflex: rubbing of the ear margin and may obtain a scratch reflex. 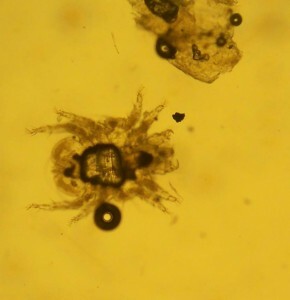 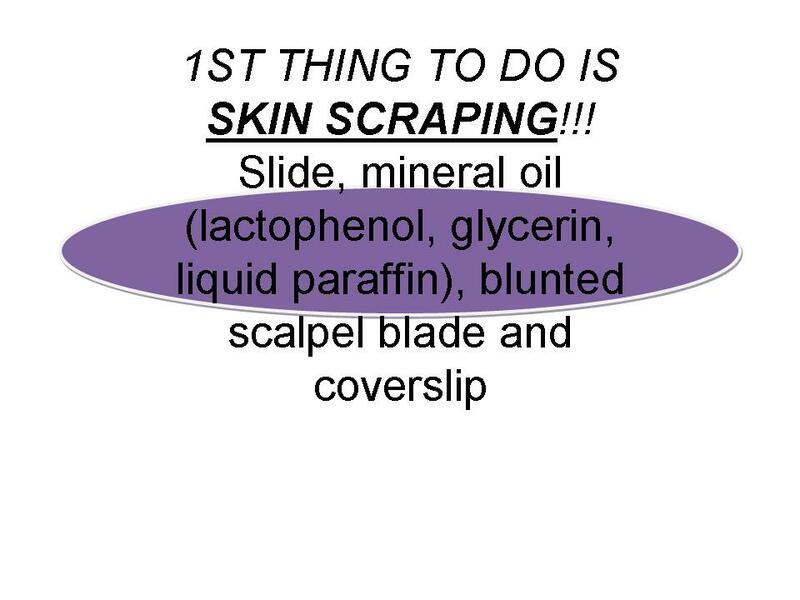 Superficial skin scraping: negative but false-negative results are commnon because mites are extremely difficult to find. 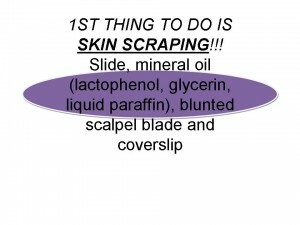 Deep skin scraping: negative (for Demodex). 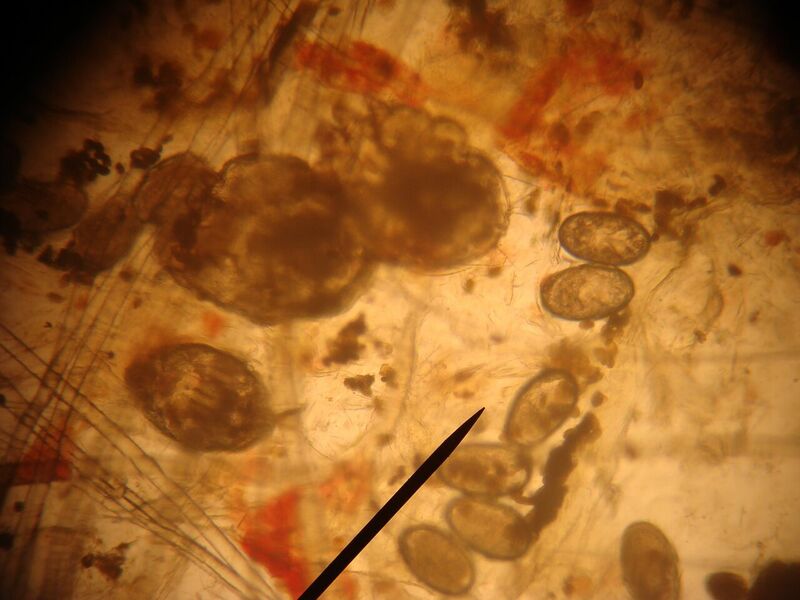 Scotch test: detection of eggs/ova mites Sarcoptidae like, Malassezia 8/OIF, bacterial cocci, macroconidia Alternaria alternata. Serology (ELISA): detection of IgG antibodies against Sarcoptes. 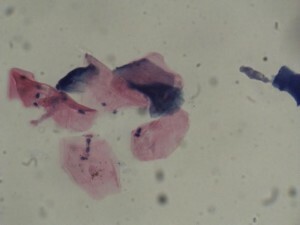 This is highly specific and sensitive test but false-negative results can occur. In this case the test was negative. 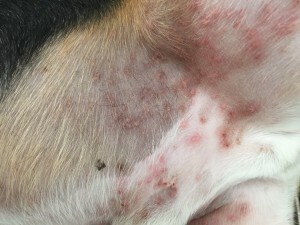 Topical treatment applied to the entire body two times per week, 4-6 weeks. 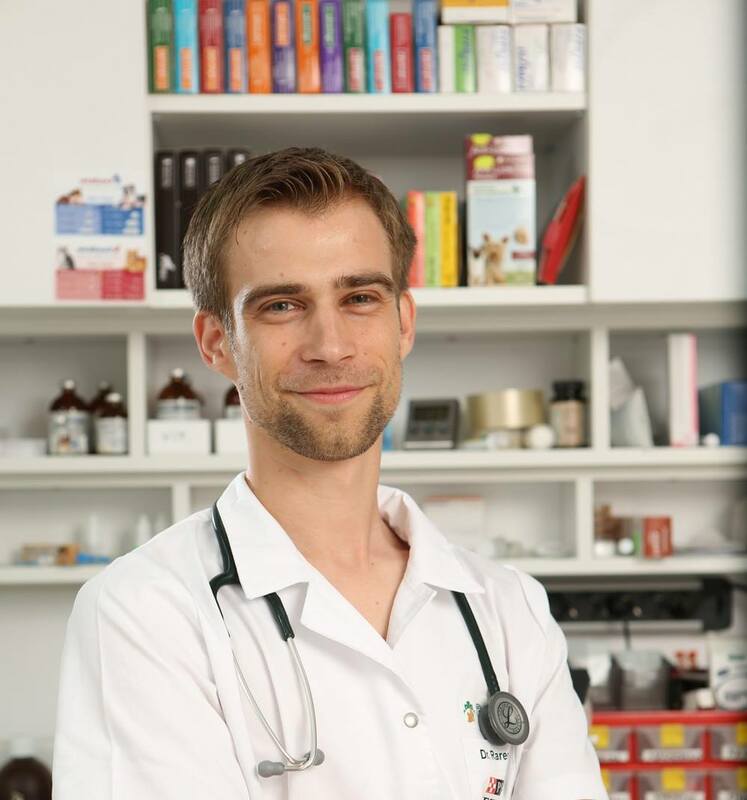 Bathing with a shampoo that contain chlorhexidine and antifungal (ketoconazole) – KetoHexidine shampoo 1%ketoconazole, 2%chlorhexidine. 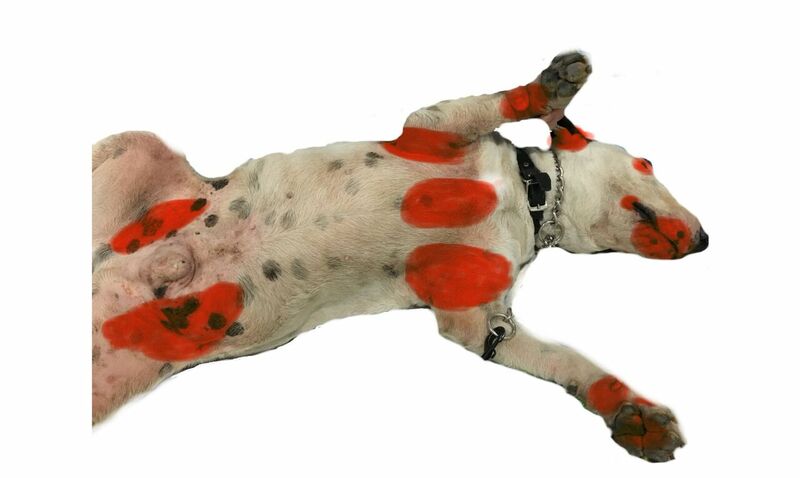 Omega 3 and Omega 6 fatty acid supplements, which reduce inflammation and itching – Megaderm >10 kg, 1 dose/day, 1-2 months. 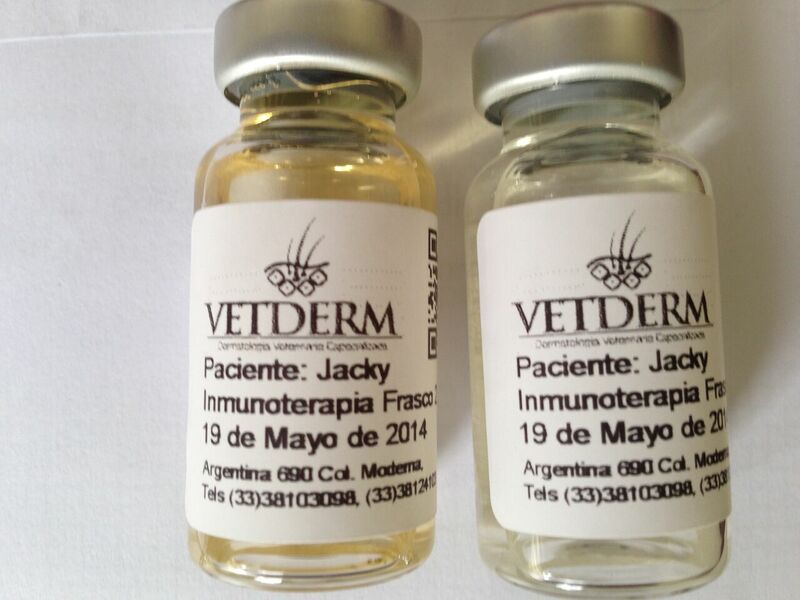 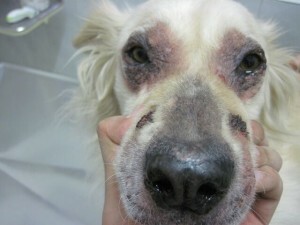 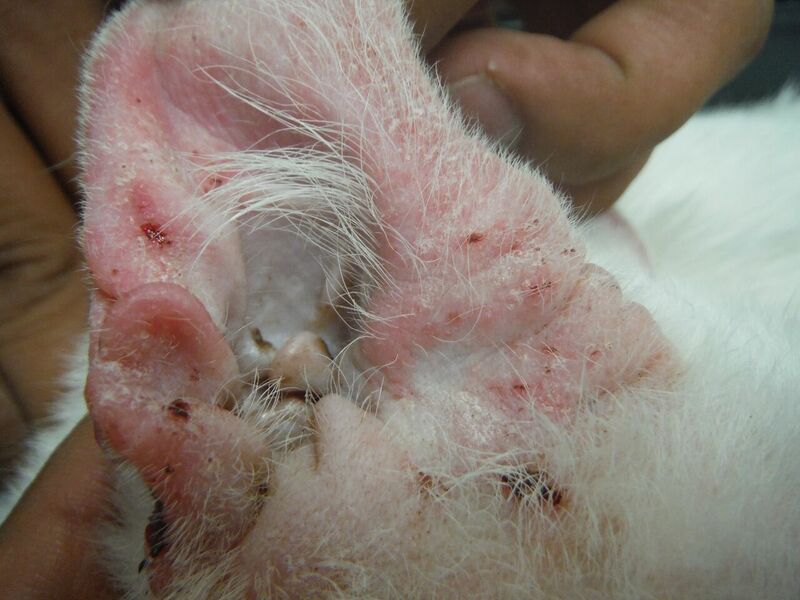 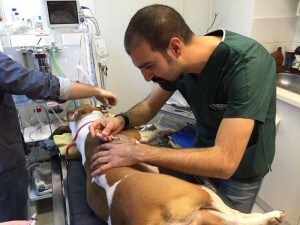 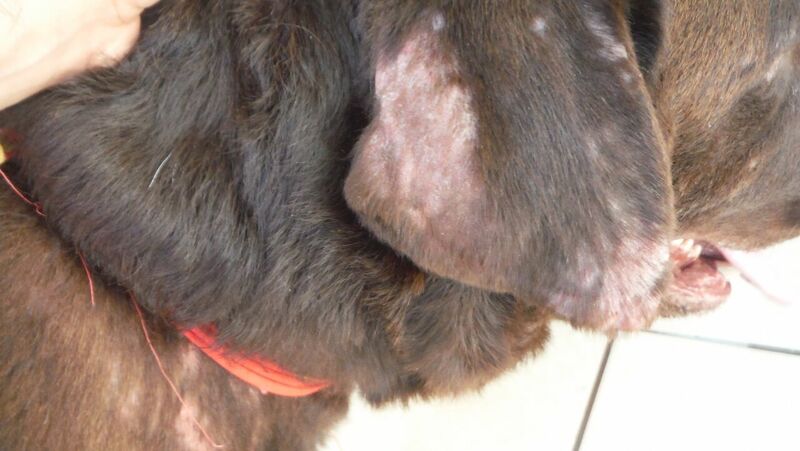 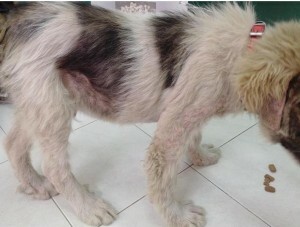 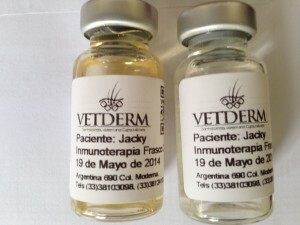 Systemic treatment with Ivermectin: 300-400 mcg/kg po or sc, once weekly for weeks. I use this scheme for 5 administration. 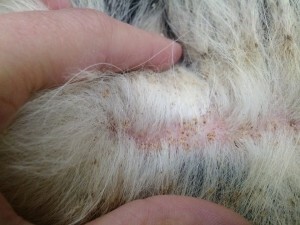 Recheck: progress, hair regrowth, decrease of the lesions. 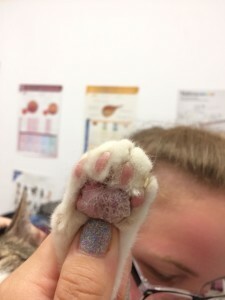 The prognosis is good. 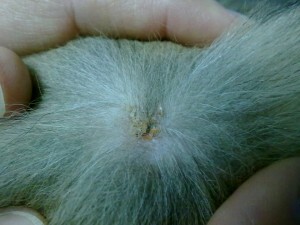 S. scabiei is a highly contagious to other animals and to humans.